This week our IT unit did community service at a home for destitute women. Several women at the home, including some of the staff, put on entertainment for us and for the other residents. I thought Dad would enjoy the experience so we took him along. 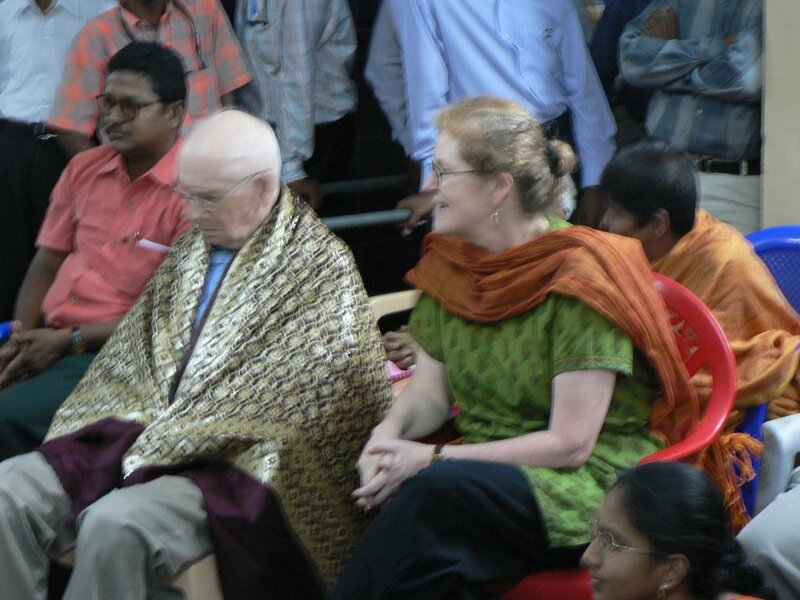 He was treated as an honored guest and got a special cloak wrapped around him and the staff was very solicitous, insisting on helping him to the car and bringing a walker for him to use. More pictures are at the top, on Flickr. There are over 100 women at Vishranthi, living in spartan but comfortable accommodations. Most are widows abandoned by their families, or otherwise left homeless. The women put on a skit about a dispute between a mother-in-law and a daughter-in-law in which the son winds up mediating to a happy ending---which most of them could not say about their own stories. 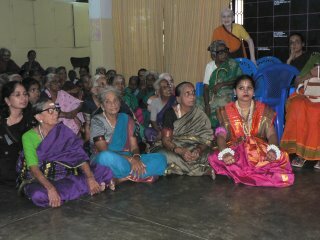 Some of the women also sang Tamil songs, accompanied by traditional instruments. The women had clearly prepared extensively for our visit. The entire walkway on the side of the building was lined with ornate rangoli and a special lunch (which we missed) was served. Dad enjoyed seeing other older people and though he didn't understand much of what was going on, he smiled a lot and seemed to have a good time. Lately he has taken to singing to himself, frequently humming the tune to "Swanee River", and the other day he burst into "America." He doesn't remember the words, but remarkably, makes up verses that, while they make no sense, do rhyme. Watching the old women the other day--their faces lit up as one of our employees joined in the entertainment to sing a old Tamil love song--it was a chance to reflect on the connection that music makes with the aged---even when they are hardly able to speak or get around. Dad did so well with the walker that I went out and bought him one to use in the house. Now, he doesn't even remember visiting the women, but he does enjoy his "new toy" as he calls it. Interesting. And saddening. I have a problem with old age homes. Even in Canada, where our health system and living conditions are great.